A Different Sanctuary Decoration but 20 beds exist in the build. Egret Tours Marina Little Port 3.0, 2.8, autodoors patch. Not so optional. Doors and many things come from this mod. Longfellow's Cabin Little Village Needed. 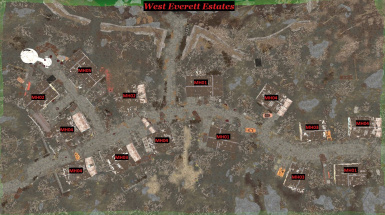 Houses are from this mod. 3.0, 2.8, autodoors patch. National Park Visitor's Center Little Village Required. 3.0, 2.8, autodoors patch. Somerville Place Little Place 3.0, 2.8, autodoors patch. 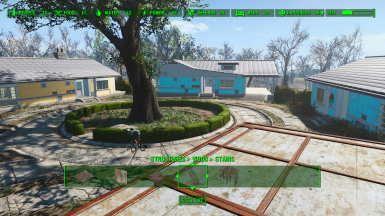 Doors, 3 houses and many things come from this mod. 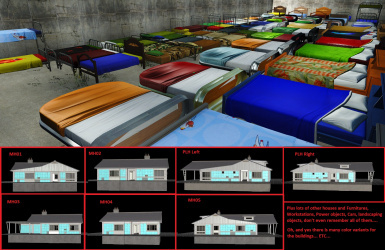 Tenpines Bluff Little Village 2.8, 3.0, auto-door patch 2.7 - Autodoor patch if you use autodoor. The Slog Little Village Required. 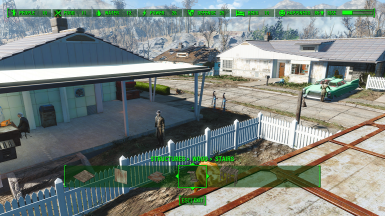 2 Houses are from this mod. Many doors. Many things. Fixed Collapsing Pocket Door Small missing its mesh. Fixed Dodge (postwar) materials, rust dont shine anymore. Added water cooler furniture gives also 1 water resource. Fixes for box hedges npc's shouldnt start stare those any more. Added couple guard workstations more. - Navmesh corrections. - New workstations: Meat Mincer and Butcher (2 versions for Butcher). 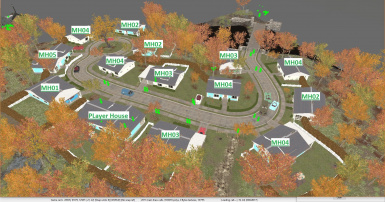 - Collision improvements for the houses. - New workstations: Meat Mincer and Butcher (2 versions for Butcher). - Add curtain snap points to the corner double windows in the build-set. Fixed and waiting update! - Added Inner Door Truss (half) to build set. - Added new stairs/steps to build set. - Added new inner corner piece (screenshot) to help build L shaped houses with the build set. - Added Boxwood without Mr. Handy animation marker. - Added new floor door to the build set. - Added Trader store rug. - HouseK01 no connection point at top of the house, it comes from the bottom under the floor. 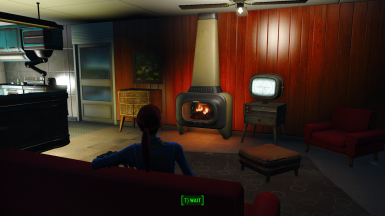 - Added keyword "DogHouseSandbox" to Dogmeat's couch now he will use it like the doghouse when he's not with you. - New MHbuildset piece "Roofcorner"
- Added one Snap point more to the each Ext. walls allowing to build easier multible storys. - Added two Castle doors small and large. Will be snappable to the castle mod when I update it! looked homemaker doors and that door what was there didn't have snap points and it didn't had that large door at all so I added them to EHB. 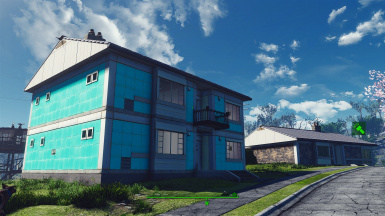 - HotFix for MH04 house and 2story roof was gone because I forgot to set it's scale back to 1 sorry about that! each container have some MinuteMen fatigues which have military ranks tailored on the sleeves and colar + tha bigest container gives also new sweater and jeans I remade. When you build these containers they are empty at the begining but if you fast travel some where and come back they are filled, containers content will respawn normaly like other game containers do. - Fixed Dodge sit anims, that I left wrongly after I Last made changes to that meshes file! - New 2Story House Some one asked me to do this kind of house few months ago and here it is. - Prefab Barn as Brahmins home it has three spots where brahmins can eat so they don't have to argue whose turn is to eat! - updated MH03 .nif to BA2 archive hope that fan is spinning now! - Adding couple workstations and furniture for Strong Just something to do for him. 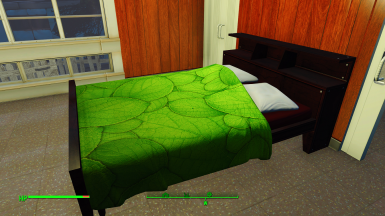 Although I suggest that you scrap those beds before updating! - Fixed closet door snap point right next to out door for all houses except MH03 that doesn't have that closet there. - Fixed green mulch mound not being green..
- MH03 gets animated (spinning) Wall Fan on the left side. - Added new wall meshes to all custom player houses + the vanilla one! - Footpath (red/gray) snappable pieces long and single with snappable borders + snappable Mulch Mound land pieces to ease placing uneven surface. - New Bed and pillow for it! - Fixed NonWorkstation EOE for not being able to attach wire (changed from static to activator) So if you have for some reason still used that somewhere scrap it cause ID has changed and cannot be scrapped without console after update !!! - New Feature Workbench combination Saving lots of space! - fixed idled kitchenbar to less attraction on it. - PL House and Special houses now have one Snap point to modular kitchen's full prefab kitchen not those separate parts and won't snap without PE mod and that's because the positioning of snap point's of modular kitchens and because there should be added actorvalue "workshopitemoverlap"not sure is it there but if it is, it's value ain't big enought. -Rerextured those Bld parts New ones are very close to old ones but bit more wood on it..
-Prewar terminal screen with scrolling text and also as relaxfurn..
-Added more snap points to SancStairs for better compinations also remade the navmesh and added optional rails for these stairs that prevents Npc's to walk shortcuts from stairs sides. these new Rails can be used vanilla floors also! and one idled piece also! -Fixed couple texture problems in MH02 also added snap point for door to the last room on the left, door will come slightly out at outside when door is open and there is nothing I can do about it! 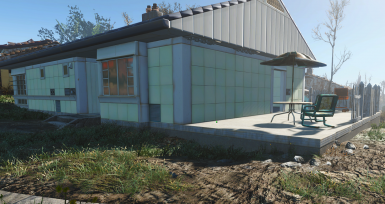 - Removed that ugly brownish hedge so like I have mentioned earlier remove those if you have placed these somewhere otherwise it's not possible later except with console command!!! - Desk with Idles "Placing Envelope" and snap point for office paper box which is also idled to "box search"
-New Houses MH01B and MH05 Ready and waiting for update..
-Dormer for MH02,03,04 (some of these houses has in prewar sanctuary this dormer so now you can snap it in the roof if you want) Ready and waiting for update..
- 3 new Houses MH01 Sanctuary and Greentop Nursery and MH04. - Fixed couple texture clipping in workbench house. - Added another door handle to modern glass door. -Driveways snaping improved these snaps also to each others. -Third snap point to the beds so you can use it as single bed also. 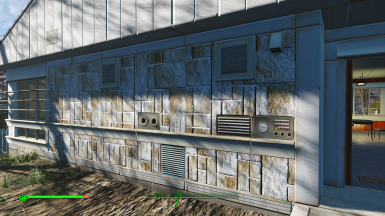 -Arggh...Don't remember all changes you'll have to try and see..
Fusion cores put these east side of house to the panel right next to entrance then whole house is powered! - Dresser prewar 5 different pcs. - Houses now supports Vanilla doors. -Snappable Carport so you can choose does the house have it or not! and I suggest that you remove all the Left side pillows before updating to this next version just to be sure your game save stays clean!!! You are not allowed to upload or modify this mod without explicit authorization! Update 3.1 is up you can find Changes in "Posts" section and "Change log"
Please read uninstallation description if you choose to uninstall later! pillows what you can use on those beds ! 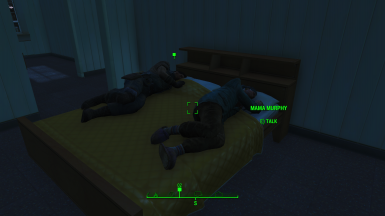 both assigned settlers will use this same bed at same time. 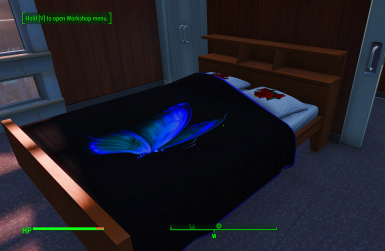 watch when your character sleeps right next to Her/Him, "Players pillow" won't add any bed resources! If you use mod called "Place Everywhere" You can easily use these pillows where ever you want! exsample. In my game few of the settlers are sleeping on the couch. to the panel Where is gage and three holes in it, then whole house is powered! each core will give 5 Power to the house. Where I can find these? 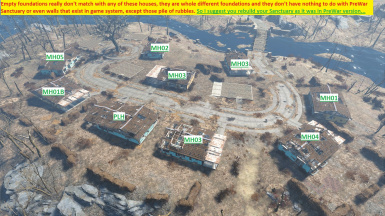 There are so many connection points added in the houses so this guide might help solve some issues. 7.then rest of it doors furnitures etc. IF YOU DECIDE TO ADD CARPORT WALLS LATER MAKE SURE THAT EASTSIDE DOOR IS CLOSED OTHERWISE WALL WON'T SNAP!!! -Always backup couble of your last saves where everything is working before installing any new mods!!!! and with all it's features!!!! Just Use NMM or manual installation! Do not use uninstaller chem when you are only updating this mod!!! Go to chem station and Craft the chem and use it! It is under UTILITY "Uninstall HZS - EHB & WDB"
if you have just working double beds it's called "Uninstall HZS - WDB"
Use it first, then save your game, exit game and unistall with NMM (or manualy delete files). feedback and suggestions is always welcome!